Dockers InterchangeMichael Barlow off due to an injury. Dockers InterchangeLuke McPharlin off due to the blood rule. We're seriously threatening a goalless opening term at Patersons as the ball continues to be ping-ponged between each defensive 50m zone. The rain's eased but the play is still average..
Mzungu looks to break the shackles in his 50th appearance for the Dockers as he gathers unopposed 45m from home. Connecting strongly it works its way out to the right where it's cleared by Hansen. BEHIND DOCKERSRain is teeming down at Patersons as a long ball to the goal square is smacked through by Bastinac who then takes the kick-out duties and bops the ball 60m upfield.. BEHIND DOCKERSDe Boer's turn to hit the scoreboard with a single digit as his ambitious hoik out of congestion turns to the left and off-breaks past the big sticks. Tied ball game. 2-2. BEHIND DOCKERSIt's a points-fest as this encounter screams out for a straight kick as Pearce gathers from 50m, slams it onto his right and dribbles it towards goal. Sneaks in for a minor. BEHIND KANGAROOSNorth doing all the pressing as Wells gathers from a pack situation and hurriedly snaps around his body. Again it's offline and shanks away to the left side for a point.. Still the 'Roos by a point as Thomas does well to juggle a chest mark before dropping it 50m out. From the right boundary, the kick is a dud and screws off the boot. Out of bounds on the full.. 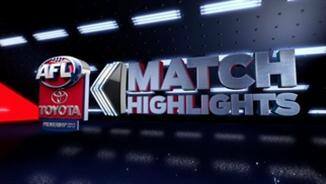 BEHIND KANGAROOSA rushed minor is the first score of the day as Wells receives a free but can only push his kick from the right boundary line to the goalsquare where it's punched through.. The ball's quickly transferred to the Kangaroos forward 50 but the story of the game so far is Crowley vs Harvey who have wrestled and traded jumper punches before the bounce. More to come. Welcome to the wide expanses of Patersons Stadium as the highflying Dockers look to take care of business against the Kangaroos, who have been patchy at best. Fremantle should be too strong..
BOUNCERucks go at it as the Perth skies threaten to open up BIG time, with ominous grey clouds overhead and nothing but rain on the local radar. Could be in for some wet-weather footy.. Welcome to Patersons Stadium for the Fremantle v North Melbourne Round 13 clash. FREMANTLE has entrenched itself in the top four with a 38-point victory over North Melbourne on a wet Sunday at Patersons Stadium. The Dockers extended their unbeaten run to eight matches, winning 10.7 (67) to 4.5 (29), in front of 31,637 fans who braved the weather. 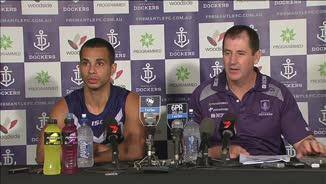 Despite the Dockers keeping North Melbourne to its second lowest score in 33 years, Fremantle coach Ross Lyon said he never felt comfortable throughout the match. 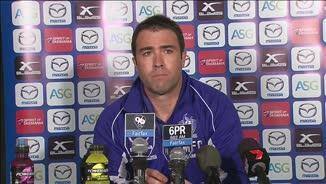 "I was really nervous coming here today," Lyon said in the post-match press conference. "You saw the Swans yesterday when it poured it's just a real grind in those conditions. It's such a big ground it makes everything really difficult." The wet conditions played into the Dockers' hands. Neither side managed a goal until Michael Barlow soccered a goal from the goalsquare in the dying seconds of the opening term to give Fremantle a seven-point lead at the first change. 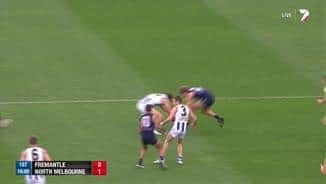 It was the class of Nathan Fyfe that separated the two sides in the second. After Aaron Mullet produced a fabulous running goal to start the term, Fyfe's brilliance shone brightly on a dull day. He took a clutch contested mark and converted from a tight angle. 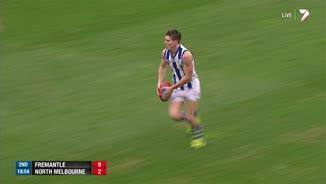 His skills and poise in the wet stood out and Fremantle's pressure suffocated the Kangaroos who managed just 1.3 for the first half, trailing by 27 points at the long break. Fremantle's pressure dropped off in the third term and opened the door for North Melbourne. Brent Harvey took a courageous mark going back with the flight and converted the set shot to cut the margin to 21. Harvey gave that goal back immediately with an ill-disciplined act. 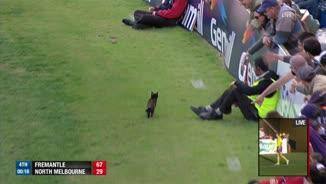 Frustrated with the close attention of tagger Ryan Crowley, Harvey struck Crowley in the throat leading to a 50m penalty and a goal to Michael Johnson. The Kangaroos stuck to their task admirably but couldn't make significant inroads into the Dockers' lead. "As you expect against Fremantle, who are a very good side, you don’t get anything cheap against them," Kangaroos coach Brad Scott said after the match. "They don’t roll over and let you score. We had to work for everything, but on the flipside they got some easy ones. "That’s the way it felt." The Dockers' 25-point margin at three-quarter time was cut to 19 when Aaron Black kicked a goal early in the final term to give North Melbourne hope. But the glimmer was snuffed out with a steadying set shot from Hayden Crozier who had been subbed in for Jack Hannath at the last change. Michael Walters added to a burgeoning highlight reel with a sublime snap from hard against the boundary line to seal the Dockers' ninth win of the year. Lindsay Thomas was subbed out during the third term with a left-hamstring injury. The leader in the Coleman Medal race coming into round 13 was held goalless for just the second time this season before he was substituted out. "He got a knock in the buttock/hamstring and it was certainly tightening up," Scott said of Thomas. "We tried to get him back out there but to me it didn’t look like he was functioning anywhere near his normal level. "We took him off, but we’re hopeful." 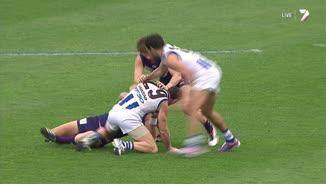 Freo's Michael Barlow was sent to hospital for scans after copping a nasty knock to the face in a marking contest in the last quarter. "We've got to send him to hospital for some investigations," Lyon said. "We're not certain yet. There's a bit of swelling. We'll know more hopefully in a short period of time."